The civil war in Spain has just drawn to a close with Franco's Nationalists taking Madrid. A young school girl walking home witnesses the death of a Guardia Civil and drops her school book. Her aunt, a communist now in hiding, offers to retrieve it for her since paper is rationed. At the body she is disturbed by two Guardia Civil officers and summarily executed for killing the nationalist policeman. Sergeant Carlos Tejada, a hero of the siege of Toledo, feels no shame or guilt for killing the young woman; as a Red she deserved what was coming to her, but he is distressed to find that the dead man is his best friend, Paco Lopez, who he has not seen for some time. Something about the crime does not add up and Tejada starts to suspect that the killing of his friend is not as straightforward as he first suspected. He starts to investigate the case and discovers his friend was connected to the black market. He’s not the only one investigating a death, however. Gonzalo Llorente is searching for the sergeant who murdered his lover whilst she was trying to retrieve his niece’s school book. The strengths of Death of a Nationalist are the atmosphere and sense of place. 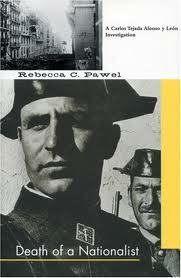 Pawel captures the general paranoia and landscape of Madrid at the end of a civil war, where neighbours are not sure who they can trust and sections of the population are being hunted and arrested, people are starving and either hardened or broken, and the buildings and streets are damaged from bullets and bombs. Sergeant Carlos Tejada is a complex lead character, a learned and cultured man but also a battle hardened veteran. He is capable of torturing prisoners and killing in cold blood, and is generally standoffish, but can also be empathetic and romantic. It’s an interesting mix, creating an anti-hero that is at the limits of reader sympathy. The other characters are reasonably well penned, but there is little in the way of back story with regards to the Llorente family with whom Tejada finds himself tangling. Moreover, the plot is a little convoluted and thin at times, and the ending is mostly told through an epilogue. Nevertheless, this first book in the series shows promise given its historical setting and lead character and I’d be interested to give the second a read. Soho Press definitely publishes interesting stuff! Thanks for a fine review, and I'm adding it to my list. I have this one (and the 2nd one) in my TBR stacks and hope to get to it soonish. Thanks for the review. The premise sounds interesting, and I like historical mysteries, especially that time period.